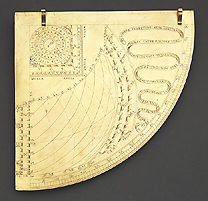 This horary quadrant displays hour lines, a shadow square, for topographical operations, and a 'Tabula Solis motus', typical of the instruments of the Della Volpaia family, used to follow the daily motion of the sun. The instrument is calibrated for a latitude of 43?, corresponding to the band of Central Italy included, roughly, between Tuscany, Umbria and upper Lazio. On the back of the instrument, the quadrant has a large iron base, permitting various inclinations, and supporting the instrument. It bears the signature of the artisan Girolamo della Volpaia, the son of Camillo and, like the other members of the family, a maker of measuring instruments.